Rates for competent private instruction is $50.00 - $70.00/hour. Group lessons range from $15.00 - $25.00/hour. There are a number of gypsy tennis pros teaching on public courts without authorization, without certification, liability insurance and continuing education or training. Their rates can range from $40.00 - $50.00/hr. John Cervantes will provide a free 1/2 hour assessment and evaluation to assist anyone in seeking tennis instruction. He is familiar with some of the best teaching professionals in the Bay Area. San Francisco Recreation and Park offers instruction. Lake Merced Country Club offers private and group lessons to the public. 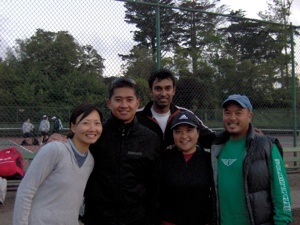 Western Athletic Clubs has 3 facilities in San Francisco offering tennis instruction. Here's a mini-shot of inspiration to keep things in perspective. Vic Braden, generally considered to be one of tennis’ best coaches, has come up with an idea to combine so many requests for his analysis of people’s strokes and the opportunity to reach people all over the world. 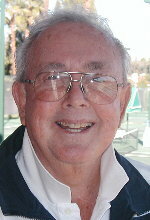 Braden has an iPhone App called Vic Braden’s Tennis Tips at only $2.99. I interviewed Ricky Leach on the mike after a charity exo once that he and Jim Grabb did with the Bryan twins at the Santa Barbara Tennis Club. I asked, "Hey Ricky, these people love doubles, what's the key? What's your best doubles tip?" "Easy," he replied, "just get a good partner." Just get a good partner. That's the same thing Todd Woodbridge said when I asked him that same question. And Mark Woodforde. In all my talks across the country about doubles, I always say, "Its not how well you play on Sunday that wins doubles matches, its how well you chose your partner two weeks before the tournament even began." What are some things to look for in choosing the right partner just for you? Well first and foremost, get someone who loves doubles as much as you and wants to go all out to win. Someone who is fired up for doubles. Someone who will want to practice with you and play practice matches. And, of course, you must have chemistry. You must also like the person -- as a person. Do you like to talk and hang out and go to dinner? Do you laugh at each others jokes? Do you get along through thick and thin or will you bicker when the first storm appears on the horizon. And believe me there will be storm clouds if you are out there competing in tennis. And there's another kind of chemistry besides personal chemistry. There is tennis chemistry. Do your games work well together? You've read magazine articles where the writers talk about the Bryan Bros. chemistry and you've heard the TV commentators talk about it, but how do, in fact, their games work so well together? Here's the real deal and what I like to see in a doubles team. I like one big server who can bring the heat and hold easy. I like one partner to be the Rock of Gibraltar on returns -- they never miss and they can rip it on big points. In a 6-4 set, and really most sets are 6-4, one player will serve three times and the other twice. If you got a guy or gal on your team who can hit bombs, you should have them serve first and they will serve three times, while you and your normal little serve will only serve twice. And that solid returner can keep you in every return game. You can pick your spots on the return and rip a few and get lucky once in awhile, while the steady returner keeps you in the game and keeps giving you more chances. With the Bryan Brothers, Bob hits left-handed serving bombs. His biggest serve ever was a 142 mph rock in Miami, while he usually averages from like 128-135 -- and that will kill a small dog. Mike on the other hand is an amazing returner. He is what I call a balanced returner and waits for either a backhand or a forehand and doesn't try to run around or guess on the return. Bob, on the other hand, is a fine returner but he looks for a forehand he can tag and goes for it and is not quite as consistent. I like both players on a doubles team to be good volleyers. If you can't volley and you want to be a good doubles player you've got some work to do. Get with your local pro and improve that shot. You don't want to fight a war down in the valleys. You want to fight a war from on top of the mountain. You want to win doubles matches at the net and not from the baseline. One more little tip: If you want good doubles partners or even good matches at your club or park, have good people skills. Be kind. Polite. Positive. Don't be a bad sport or moan or complain. Praise and thank others. Buy the balls. Buy the drinks or food after the match. Be a good person. And then obviously people will want to play with you. Nobody wants a knucklehead for a partner. To purchase Bryan’s book “Raising Your Child to be a Champion in Athletics, Arts and Academics” go to Amazon.com http://www.amazon.com/Raising-Child-Champion-Athletics-Academics/dp/0806526602. The name Shuzo Matsuoka has become synonymous with the agonies of cramping on a tennis court and 15 years have now passed since the Japanese was left was screaming and writhing in pain on court during his U.S.Open first round match against Petr Korda, knowing he would lose the match if he resorted to any medical assistance. Caught between agony and the Grand Slam rules at the time, Matsuoka was made to suffer until he was finally defaulted for delaying the match. Tennis history will show the rule-makers were forced into a rethink soon after fans on Grandstand Court booed the inhumanity of it all. Kei Nishikori was only four years old at the time but he knows the story well. Matsuoka is currently a mentor and has long been an inspiration to the 20 year-old who has succeeded him as Japanese no.1 ranked tennis player. The experiences of his predecessor was very much on Nishikori’s mind as he came through a five hour marathon is torturous heat to beat 11th seeded Marin Cilic in five sets. 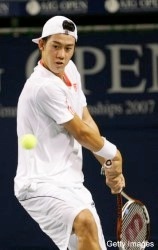 At the beginning of 2010 after countless players abused the cramping rules brought in as Matsuoka’s legacy and used them as just an opportune moment for a rest and perhaps destroy the prevalent opponent’s rhythm, the International Tennis Federation decreed medical timeouts for a loss of physical condition were no longer allowed. Nishikori admitted he began to cramp as early as the second set of his 5?7, 7?6, 3?6, 7?6, 6?1 win over Cilic that sends him through to a third round confrontation with 21st seed Albert Montanes of Spain. “I was thinking about it in fourth set mostly,” said the 147th ranked qualifier who missed almost a year because of wrist problems before returning to tennis in the spring of this year and feared his highly promising career could be over before it had hardly started. “I thought even if I win this, I have to play one more set. It's not going to be easy for me as I felt I was cramping. But I was able to fight through. Dr. Jim Loehr is a world-renowned performance psychologist, co-founder of the Human Performance Institute, and author of 15 books including his most recent, “The Power of Story.” He also co-authored the national bestseller “The Power of Full Engagement.” To learn more, check out http://hpinstitute.com. As someone who has explored the psychological landscape of competitive sport for more than 30 years, I found Andre Agassi's new book to have compelling messages for navigating the extraordinary pressures of high pressure sport. There are lessons for parents, players, coaches, trainers and friends. The lure of fame, power, external success can be intoxicating. The pain, sadness, disappointment that inevitably surfaces when the goal of the sport becomes misguided is revealed with gut-wrenching clarity in Andre's life story. When parents, players and coaches understand that the ultimate goal of tennis is to forge strong healthy fully functioning human beings, an entirely different field of forces become mobilized. Without the right purpose, everything that follows becomes jeopardized. The following six quotes from Andre's book represent the core takeaways from his lifetime of struggle. Each of these quotes contains a compelling lesson in and of itself. * Their last meeting before Sunday came last year in Shanghai with Davydenko prevailing 6-3, 6-2 in round-robin play. * Davydenko is now 5-0 in finals this season (19-5 in career).